Who will bell the climate change cat? Torrential rain, cloudbursts, flashfloods are wreaking havoc in large parts of the world. Countries such as Greece are seeing wildfires ravaging one part, and flashfloods leaving people helpless in others. While large swathes of China and India are experiencing record temperatures, thunderstorms, continuous downpours and floods other parts have paralyzed people's daily life and destroyed houses and properties. Europe, despite its strict environmental laws and relatively low levels of emissions, is also feeling the heat of climate change. In Southern and Western Europe, temperatures were forecast to break the 48 C record set in Athens in 1977, thanks to the waves of scorching hot air sweeping in from Africa. The unbearable heatwave in Europe has already caused wildfires and crop failures. Now it seems set to claim freshwater fish as its next victim. Reports say rivers such as the Rhine in Germany and Austria and the Elbe in the Czech Republic have soaked up so much heat that fish are beginning to suffocate. And several nuclear power stations in Germany are lowering their energy outputs because waters from rivers used to cooling the nuclear plants are too warm to do the job. 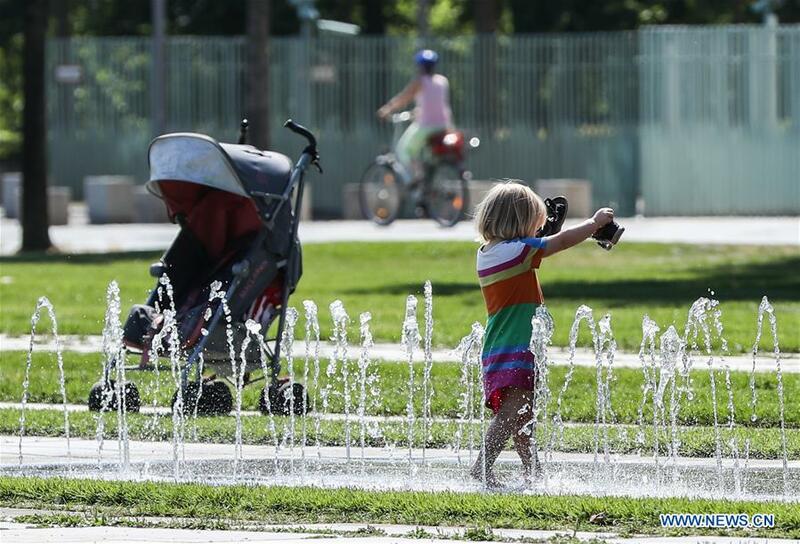 Large parts of China are in the grip of unprecedented high temperatures. Average temperatures in China have already risen 1.35 C since 1950, nearly double the average global increase, making it one of those countries suffering the severest effects of climate change. As if that was not enough, now comes more disheartening news. Research conducted by the Massachusetts Institute of Technology says extreme heatwaves could make China's northern plain, one of the most densely populated places on Earth and one of the most important food-producing areas of China, uninhabitable in places toward the end of this century if global warming is not curbed. China has been doing its part to fight climate change. It already has the world's largest installed capacity for wind and solar power. Of course, it has to do more－for example, promote more use of non-fossil fuels and reduce that of fossil fuels. But no country, China included, can combat climate change alone and make sure global temperatures don't rise above 2 C by the end of this century, as mandated by the UN Intergovernmental Panel on Climate Change. That would be possible only if all countries work together. Yet US President Donald Trump, true to his climate change denier image and ignoring California's desperate battle against wildfires, is set to further weaken US vehicle emissions standards adding fuel to the fire that global warming has become. On Trump's instructions, the Environmental Protection Agency has proposed to set the fuel efficiency standards at the 2020 levels. This would prompt cars and light trucks to travel about 51.5 kilometers per gallon instead of the previously mandated 74 km, and thus emit more greenhouse gases worsening global warming. Not content with the tariff wars he has already launched against some US trade partners and the specter of a full-blown trade war he has let loose on the economic world, which have diverted the world's attention from the fight against climate change, Trump is impetuously determined to help the oil industry unleash an even fiercer attack on nature. And now that he has pulled the US out of the Paris climate accord, even the whimper the world has become accustomed to hearing at the annual UN climate conference in the recent past may not be heard this year. Perhaps if the rest of the world works together, just like many economies have stood up against the US trade policies, the future can be secured for future generations. But for that, the world needs to heed more than just the sound of money. The author is a senior editor with China Daily.